The Chairman of the National Reconciliation Committee of the Peoples Democratic Party and Governor of Bayelsa State, Honourable Henry Seriake Dickson, has urged the PDP leaders and members to focus priority attention on the future in order to actualize the objectives of the party to take over power in 2019. A statement signed by Dickson’s Special Adviser on Media Relations, Mr. Fidelis Soriwei, quoted the Governor to have made the comment while leading the members of the Reconciliation Committee on a visit to the Chairman of DAAR Communications, High Chief Raymond Dokpesi, in Abuja on Wednesday. Dickson said that while it was a fact that the past was important as a guide to shape the future, the PDP leaders and members had a responsibility to focus their energy on the challenges ahead of the party. 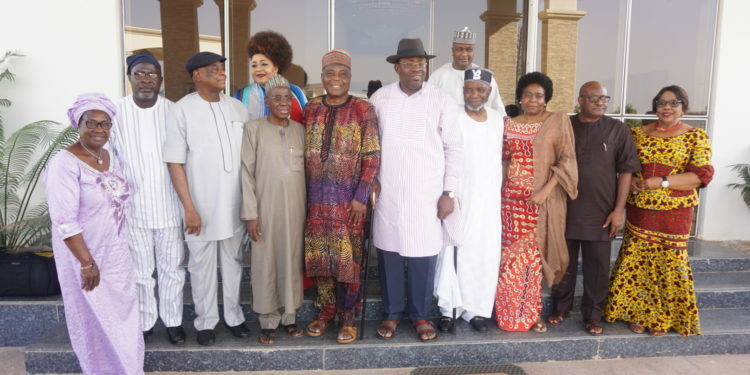 Dickson stated that the committee visited Dokpesi to interact with him because there was need to reach out to as many political leaders as possible who have played key roles in the party and whose efforts are crucial to the success of the party in the future. He commended Dokpesi for his maturity and love for the party as shown by the statement he issued accepting the outcome of the convention and restraining his supporters. He said, “Now the convention has come and gone the way it did. As party leaders, we know that even though it was a family contest, there was need to reach out to leaders who have played key roles in the party, and whose contributions moving forward would continue to be significant. We thought we should interact with you, to share ideas with you, to discuss some of the concerns and issues that have arisen after the convention. In his reaction, Dokpesi assured Dickson and the members of the committee of his determination to sustain continuous support for the PDP. He stressed that he would not withdraw his support for the party as a result of the events which characterized the December 9, 2017 National Convention òf the party which produced Prince Uche Secondus as National Chairman. He said that his major mission was to oust the ruling All Progressives Congress from power in 2019. Dokpesi recalled his pre-convention position that the outcome of the convention would be accepted since being elected Chairman was not a do or die affair. “There are quite a number of things that were said before the convention. I believe that Nigerians will recall I said that the convention and the election that we are going into was not a matter of life and death. I did say that I was conscious of the fact that power comes from God, and whoever emerges, I will give my unconditional support, to ensure that this party is able to fulfill its mission, to ensure that the challenges that are ahead can be overcome much more easily. “I had defining moments where I would have on that Saturday made one or two statements that would have totally damaged the convention. But that is not my mission. My mission is to ensure that this present APC Government is removed out of office. “So whatever were the shortcomings, I had already agreed and and i signed documents twice that I would unconditionally support whoever comes out of it. I pray for the PDP, I pray that we get it right. Be assured I will continue to give the PDP all the support that I need to give the party. He commended Dickson for his commitment and sacrifices in ensuring the prevalence of peace within the PDP. He stressed the committee’s visit was the first of its kind embarked upon by PDP leaders immediately after a national convention.